← Is “Go Fast, Go Hard” Contagious? Do BYU QBs Have Favorite Receivers? BYU has seen its share of changes at quarterback over the past 3 seasons, with 4 different QBs getting at least 1 start during that span. A question that is often raised is just how much does a change at QB affect the distribution of passes to the receivers? In other words, do different QBs have different “favorites” they like to throw the ball? Below is a heat map showing how often receivers were targeted (i.e. were recorded as the intended receiver, regardless if the pass was actually completed) by different BYU QBs over the past 2 seasons. The heat map shows that there were definitely some receivers that benefited/suffered by the change in who was throwing the ball to them. Conventional wisdom was that in 2011, Jake Heaps favored Apo more than Hoffman and it was vice versa when Riley Nelson took over as the starter. It turns out in this case that conventional wisdom was actually correct. 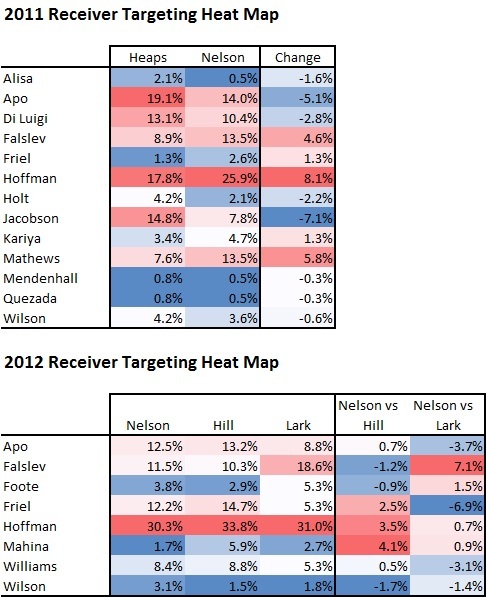 Heaps threw to Apo 19.1% and Hoffman 17.8% of the time, but Nelson only looked to Apo 14.0% and Hoffman 25.9% of the time. That’s a pretty pronounced swing in receiver preference. Something that appears to have gone largely unnoticed is that McKay Jacobson suffered even more by Nelson’s playing time, having his targeting percentage cut nearly in half, from 14.8% to 7.8%. In 2012, the distribution of the ball was a little more consistent between QBs. The biggest differences were that JD Falslev was targeted much more frequently (7.1% increase) and Kaneakua Friel much less (6.9% decrease) by James Lark, compared to Riley Nelson. All 3 QBs in 2012 relied equally heavily on Cody Hoffman, targeting him between 30.3% and 33.8% of the time. With most of the receivers from 2012 returning in 2013, it will be interesting to see if the ball distribution will be a little more even than it was last year. I suppose you’re talking about completed passes. Count all the uncatchable passes at Apo’s feet, and the stats might even up a little for him between 2011 and 2012. Hoffman’s definitely the outlier, though, for good reason. Hah, did I really miss that these are intended receiver stats, or did you edit that? Anyway, only the part of my previous comment about Hoffman applies now. Quarterbacks are bound to have favorites when they have some receivers who perform better. Still wonder about all the uncatchable passes that went towards Apo. There were hints that he wasn’t running his routes right, but if so, he must have been way off. He was open. I just hope Apo is more aggressive about sticking his neck in there to get a ball. Sounds like he has put on some more muscle weight. Hoffman had plenty of bad throws his way, but that didn’t matter as much for him. If you have all the measurables you still need the heart to prove yourself. Fans sure hype Apo up, but all that matters is what you do on the field. Precise routes and sure hands are more important than height and speed. YAC is important also. I think Apo will do better this season, but keep your eye on Ridley if you want to see someone really getting it done.